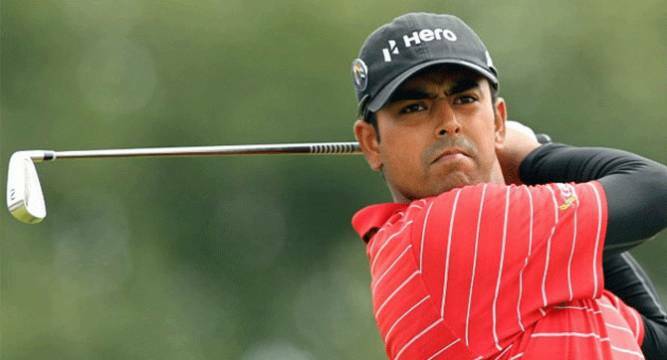 Anirban Lahiri once again struggled on the greens at the difficult South Course at Torrey Pines, in the first round of the USD 6.5 million Farmers Insurance Open. Lahiri, who co-led after the first round of last week’s Career Builder Challenge, carded eight-over 80 that makes his task of making the weekend rounds very difficult. The South Course played extremely difficult as even defending champion Jason Day (72) and Rickie Fowler (73) at tied-76th and tied-90th were in danger of missing the cut. Of the 33 players who shots in the 60s, only 12 of the scores came on the South Course. KJ Choi and Chesson Hadley each had a 68. Scott Brown, who was two over through six holes, finished with eight birdies over his last 11 holes for a 6-under 66, giving him a share of the lead with Andrew Loupe, who shot 66 on the North Course. Brown and Loupe had a one-shot lead over five players, including Billy Horschel, who all played the North Course. Just as was the case last weekend, Lahiri, tied-28th at Career Builder, missed a whole lot of par and birdie putts, many inside eight feet and a few more between 10-15 feet. He did hit well and gave himself opportunities, but hardly any were converted. Ironically he started the day with a nice par putt from almost 15 feet, but then bogeyed the next missing a par putt from 16 feet. A birdie came his way on the third, but the miss from seven feet for par putt on fourth put ruined the momentum. He missed a birdie from inside eight on fifth but again recovered well for a birdie on par-5 sixth, at which stage he was even for the day. Then came the problems. He bogeyed seventh and ninth, missing a par putt from seven feet on seventh. After the turn, the take of missed putts stayed as such, as he bogeyed 10th and 12th, double bogeyed missing a five-footer for bogey. Things did not improve as another 11-footer miss meant a bogey on 16th and on 17th he missed from two feet for par. With the current mark at one-under, Lahiri will need a outstanding second round on the North Course to stay. Defending champion Day, who had flu and missed the pro-am, shot 72 on the North Course. He was lying tied-76th. Day’s card one shot better than Fowler, who won Sunday in Abu Dhabi and struggled on the greens for a 73, that placed him tied-90 and was in danger of missing the cut. Phil Mickelson, two-over after five with a double bogey, recovered to three-under 69 and was tied-15th.